I didn’t want to leave anything out in the title–I’m in love with all the ingredients in this dish. Days when I don’t have a meal planned. Days when I’m not “feeling” what I have planned. Days when I end up not having time to make what I have planned. Those are usually nights when my hubs gets home late from work. We don’t let my daughter watch TV yet, so it is hard to prepare dinner unless he is home to help keep her entertained. I like it because it keeps for a while in the fridge. Gross? I’m over that. I like that it keeps for at least a couple weeks so I always have a back-up plan. I also like it is versatile. I can serve it with rice and veggies or a I can throw it into a pasta with whatever I have in the house. I also like the different varieties offered, because I find that they inspire recipes (such as this one.) 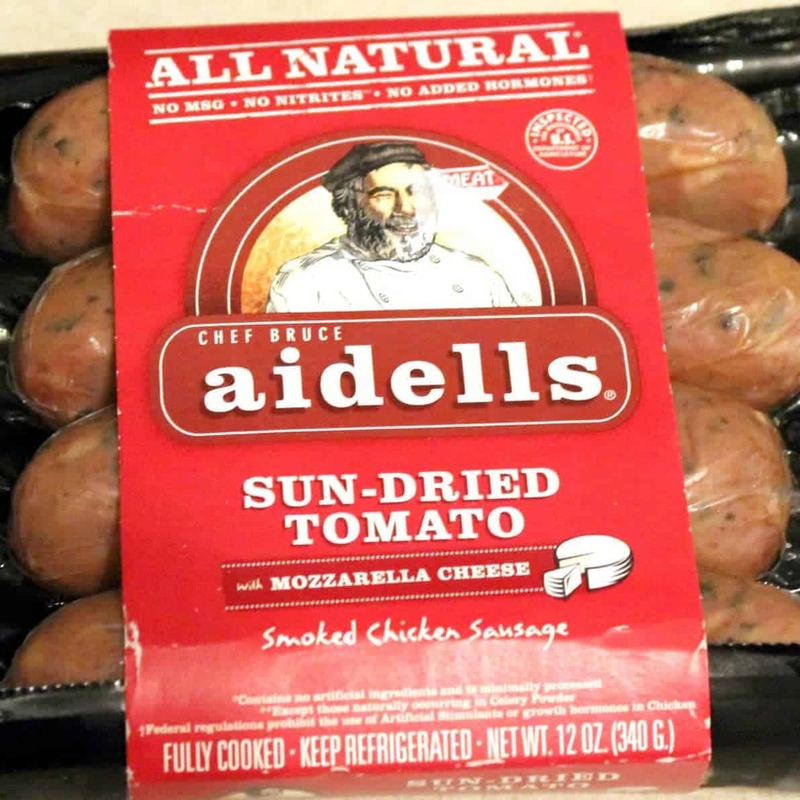 Note: This is not a sponsored post–I’ve just been on a chicken sausage kick. I haven’t found one particular variety of chicken sausage that I love over all other varieties, I buy what is on sale. Like I said, I was inspired by this variety of chicken sausage. I tossed it with whole wheat pasta, tons of veggies, and fresh mozzarella. Healthy, filling, delicious. And as always, easy. 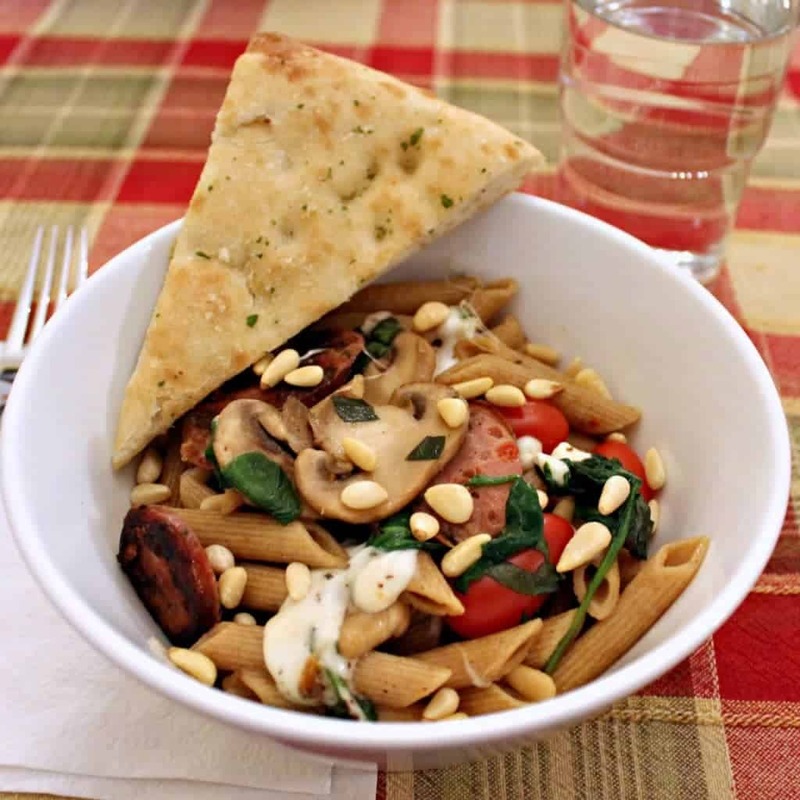 I topped this pasta with toasted pine nuts. Or if you’re a fancy-pants: Pignolias. I could eat the suckers by the handful. But I’d go broke. If you’re not a fan, you can eat this pasta without them, or you could grate some Parmesan over the top. But I would strongly encourage the addition of the pine nuts. To toast, I throw my pine nuts on a paper towel and heat them in the microwave, 30 second intervals until they are toasted and fragrant. Don’t tell anyone that I cheat and use the microwave, but why get another pan out? 1. Put on water to boil and cook pasta according to package directions. 2. Meanwhile, heat 1 Tbsp olive oil in a large skillet over medium-high heat. Add in sliced sausage and cook until browned and slightly crispy. Keep an eye on them, I almost burnt mine! Remove to a paper-towel lined plate. 3. Toss in mushrooms and sauté until browned and cooked. 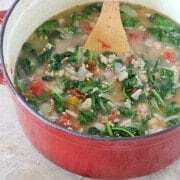 Toss in spinach and grape tomatoes and cook until spinach is wilted and tomatoes begin to split. 5. Garnish with toasted pine nuts. Verdict: So tasty! Loved all the flavors in this pasta. Great meal for a busy week night. Good left over too! Changes I would make: None! Well, I’d try to cook my sausage a little more evenly, but it still tasted great. Difficulty: Easy! I’d recommend doing some veggie preparation beforehand, that way you can keep a closer eye on your sausage while it is browning. I’m not naming any names, but that is where someone (okay, ME!) nearly failed in this recipe. What a delicious looking pasta and that sausage – a great find! Oh my gosh – I’m in love. I am making this. It looks fantastic!! I love chicken sausage! We eat it a lot in our house too :) I also agree that I like that it keeps a long time…gotta have a backup! I love all the deliciousness you threw into this pasta. Totally delicious and full of flavor. Found you through Lisa’s Dinnertime Dish and this pasta looks amazing! Thank you! It was so tasty–and super easy! 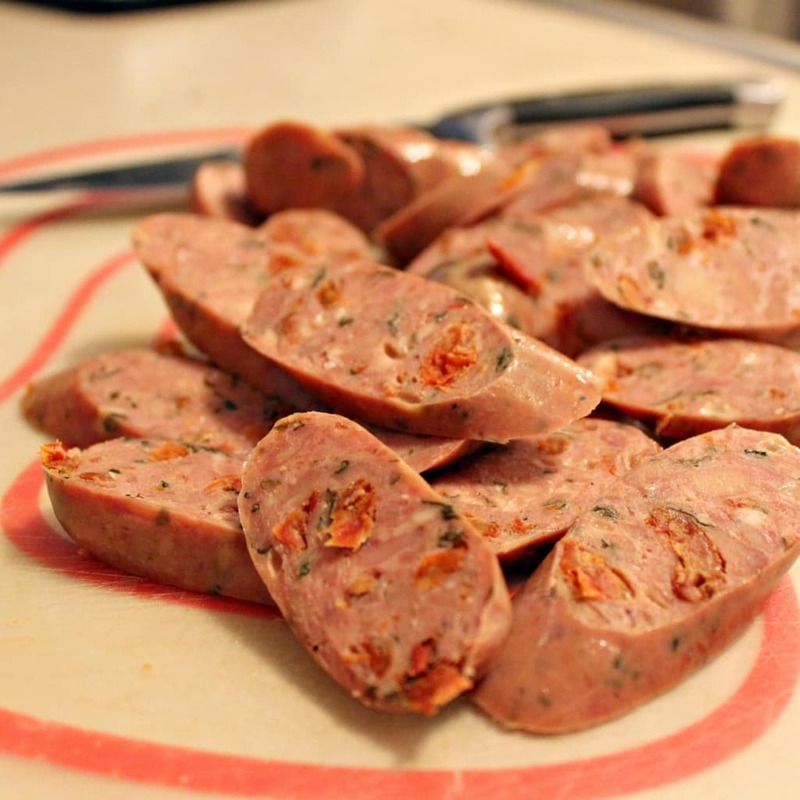 I have that same sausage in my fridge right now ~ for all of the reasons you mentioned. I actually stocked up at Costco. I love the dish you created. And I have never tried the microwave to toast the pine nuts…. Can’t wait to try that! Great tip. This looks like such a wonderful dinner! Great flavors and I love the addition of the chicken sausage. I love how suddenly everyone is cooking comfort foods. This looks so good and comforting with lots of healthy ingredients. Wow, totally trying to toast my pine nuts in the microwave! Genius! What a great combination of flavors! A perfect weeknight dinner for sure. Looks delicious! I had no idea you could toast pine nuts in the microwave! I love that there are other people who have to ‘feel’ the meal that they’ve planned. That happens to me so often. I have it all planned out then the day comes and I don’t feel like whatever’s on the plan. It’s great to have a backup. Sounds awesome! I love a good pasta dish! YUM! I have a surprise for you!! Please stop by my page. What a beautiful pasta dish. I would love all of these ingredients. I wish I could just pop by and have some! So nice and healthy! I meant to say earlier that I loved your meal planning post from a couple of days ago. I’m gonna try that! Sooo bad a meal planning! I could take a nap inside that dish. 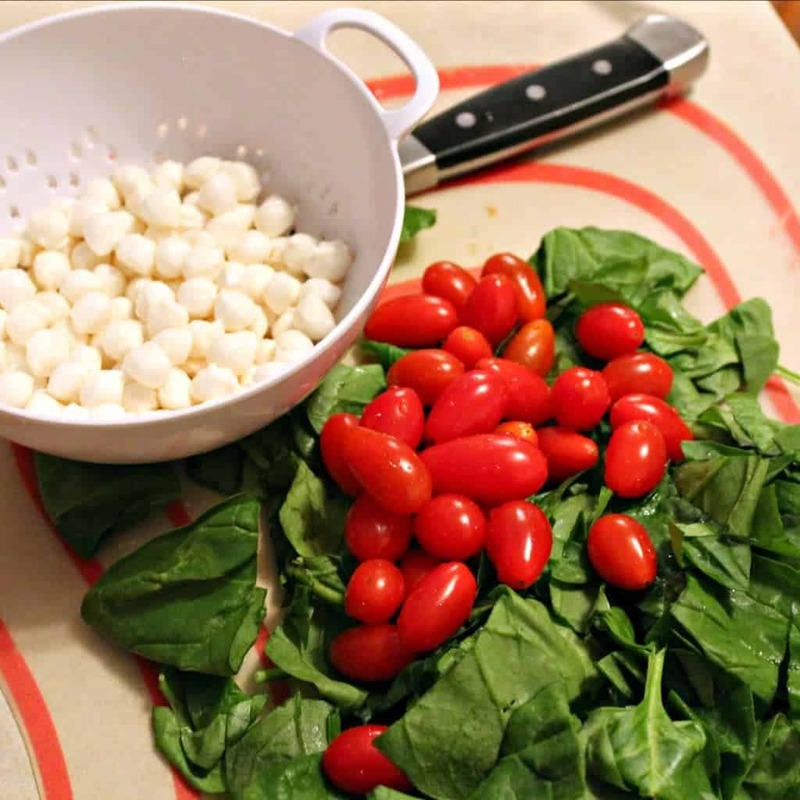 Oh I love all these ingredients – especially the pine nuts, mozzarella and spinach!! YUM-O!! Best part, I’m pretty sure my husband and girls would love it too! 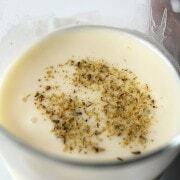 By the way – I linked your pumpkin seed recipes on my blog yesterday. Such a great idea! Yes – fake chicken…or nothing – this recipe seems so flavorful!! 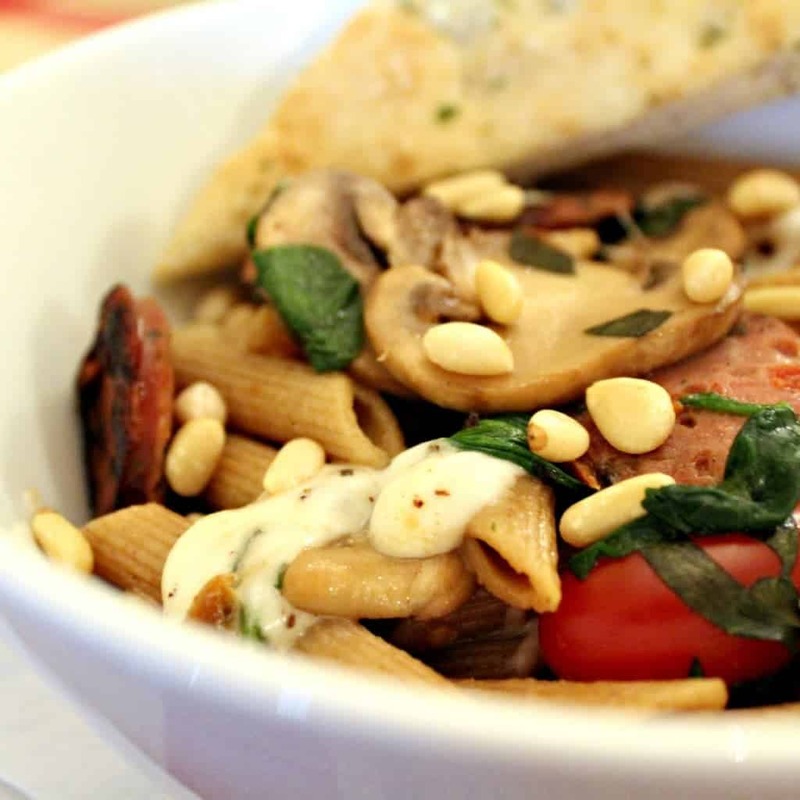 I bet it could hold its own without the sausage :) Oh my gyah, I’m hungry for this pasta bowl right nowww! It definitely could, especially with the whole wheat pasta. Love it! 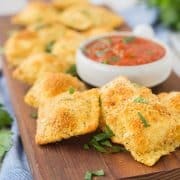 This is my kind of meal for sure, easy and super tasty! Oh yum, I bet they are! Girl! Wow! This looks amazing and all those extra goodies in there like the cheese and basil and mushrooms just make it extra special. A new favorite of mine is chicken sausage and I can’t wait to take this recipe and make it for myself- i mean my family of course- of course they can have some too:) LOL! Oh the flavours in this sound delicious! Perfectly warm and comforting, especially for Autumn. And I love the trick about toasting pine nuts in the microwave! It is so quick and easy, I toast all my nuts in the microwave!